I know it isn't even Thanksgiving yet, but I've already started thinking about my Christmas baking. Cookies, to be precise. Every year I teach a holiday cookie class. Last year's class was dubbed "cookie-ganza" by a friend because instead of teaching old beloved favorites, I taught a class of mostly new recipes...which meant I spent a good portion of the fall baking (and eating) Christmas cookies. The recipes for many of those cookies ended up on my blog...but a few did not. 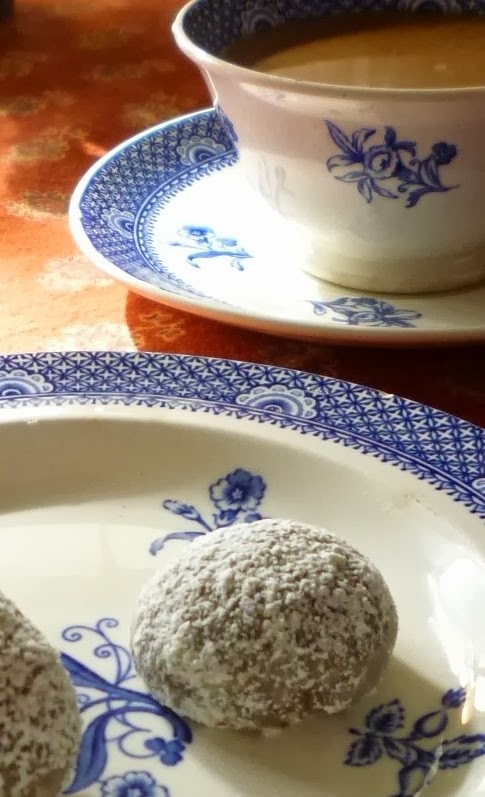 Chocolate-Espresso Snowballs—the first cookie I tested—was one of those that I didn't post. Since I made a batch this morning (sort of a warm up for the baking extravaganza to come), I thought I would share the recipe now. The idea for this recipe came from Food & Wine magazine. They published a recipe for Chocolate Espresso Snowballs in December of 2011 (Gourmet published an almost identical recipe—called Mocha Pecan Balls—way back in December of 1993). When I looked closely at these recipes I realized that they were just variations on my old childhood friend "Russian Teacakes" (sometimes called "Mexican Wedding Cakes" or "Snowballs"), made with cocoa and the grown-up addition of espresso. 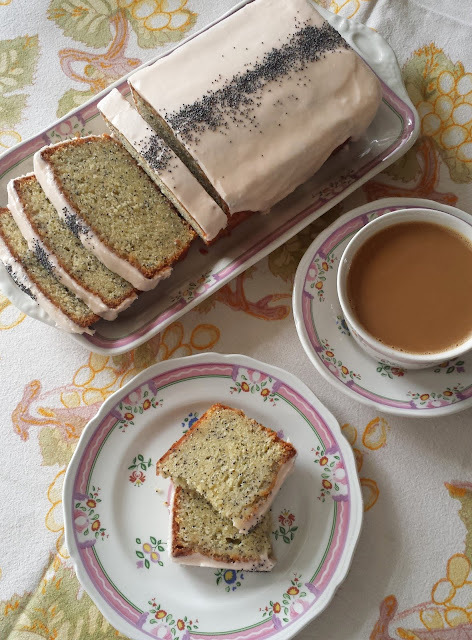 Since I have always thought my preferred version of Russian Teacakes (learned in Junior High Home Economics...I think it is probably a Betty Crocker version) was the best, I decided to adapt that recipe rather than use the one published in Food & Wine and Gourmet. I only have one bit of advice for making these cookies—but I think it's important. Be very careful not to over bake them. One of the things I have always liked about the Russian Teacakes that I make is that they are tender and moist. If over baked even slightly, they are quite dry...they lose almost all of their charm. The same goes for this chocolate and espresso version. In fact, one of the reasons I made these cookies today was to double check the recipe before my class rolled around. Last year, after testing this recipe and coming up with a cookie that kept calling me back to the cookie tin for just one more, the cookies that I made for my class were just OK. I was puzzled by this. I thought that I might have written something down incorrectly in my final version of the recipe—although I suspected that I had probably just baked them a bit too long. Well, this must have been the case. The cookies I made today were delicious...but I kept a careful eye on the oven as they baked. You will know the cookies are done by the way they look: the surface of the dough will have lost its wet sheen and the cookies will have puffed slightly and begun to crack. Once they look like this, remove them from the oven right away. They will be too fragile to remove from the baking sheet at this point. Allowing them to rest on the sheet for a minute (no more) will give them time to firm up. At that point, they may be transferred to a wire rack...or, you may do as I do and simply slide the entire sheet of parchment off of the cookie sheet (only do this if you are using a cookie sheet without a rim). If you like Russian Teacakes...and chocolate....and coffee..., I think you will like these cookies. They pack a strong mocha flavor punch...have just bit of soft crunch...and are tender and moist. And there is absolutely no need to wait until Christmas to make a batch. Place the flour and pecans in a food processor and process until the pecans are finely ground. Add the cocoa, espresso and salt and pulse to blend. Set aside. Briefly cream the butter and sugars. Beat in the vanilla. Add the dry ingredients and mix to form a soft dough. Chill for 1 hour, or overnight. log and then cut the logs into 10 equal segments. and place on parchment-lined baking sheets, spacing the cookies at least an inch apart. Bake the cookies in a 400° oven until the tops appear dry and the cookies have puffed slightly and begun to crack—about 9 minutes (be careful not to over bake...the cookies will be dry). Cool on the sheets for one minute (the cookies are too tender to transfer from the sheets when they first come out of the oven). Allow the cookies to continue to cool for another 5 minutes. Roll the cookies in powdered sugar (be gentle, they break). Finish cooling on a wire rack. Sift more powdered sugar over the cooled cookies to give them a neater look. Store air tight. Katrina, Considering how many years I taught version 1 of this class, there is always a chance that you'll be in Lawrence someday when I'm teaching version 2!